Total seats available for the course are 18.Only 3 vacancies left. Registration closes as soon as seats are confirmed by payment. This includes Lunch,Tea, Coffee,Course Material, 1 week Observation at a IVF center of any of our faculties ,subject to availability. STAY NOT INCLUDED. 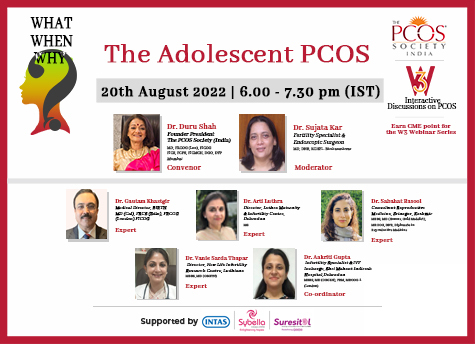 For PCOS Society Members : 1,15,000/- (inclusive of GST): This includes Stay for 6 days on twin sharing basis with Breakfast, Lunch,Tea, Coffee,Dinner,Course Material, 1 week Observation at a IVF center of any of our faculties ,subject to availability. For Non Members: 1,20,500/- (inclusive of GST): This includes Stay for 6 days on twin sharing basis with Breakfast, Lunch,Tea, Coffee,Dinner,Course Material, 1 week Observation at a IVF center of any of our faculties ,subject to availability. For PCOS Society Members : 1,35,500/- (inclusive of GST): This includes Stay for 6 days on single occupancy basis with Breakfast, Lunch,Tea, Coffee,Dinner,Course Material, 1 week Observation at a IVF center of any of our faculties ,subject to availability. For Non Members: 1,40,500/- (inclusive of GST): This includes Stay for 6 days on single occupancy basis with Breakfast, Lunch,Tea, Coffee,Dinner,Course Material, 1 week Observation at a IVF center of any of our faculties ,subject to availability.